Improving Care Across the Continuum also helps hospitals and other providers share their care-improvement efforts among each other. MHA understands the positive effects of collaboration from our efforts as a Hospital Engagement Network, bringing together hospitals from across the state to share best practices to reduce infections and readmissions. Thirty hospitals, physician practices and other care entities participated in MHA’s second Accountable Care Compass Awards, creating targeted healthcare initiatives with proven, positive results. 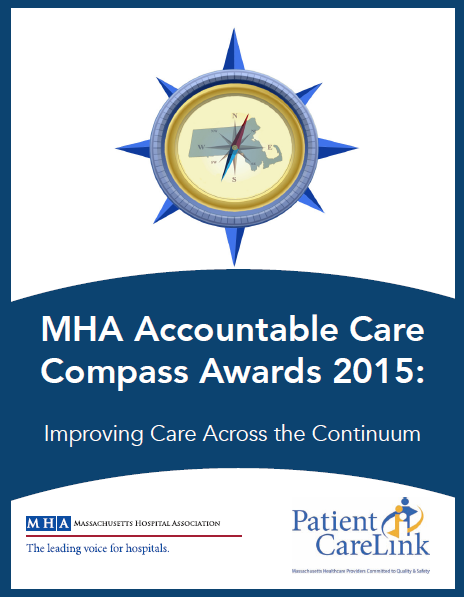 Summaries of those 60 initiatives have been published in this document – MHA Accountable Care Compass Awards 2015: Improving Care Across the Continuum. The work detailed in the publication’s pages show the quality improvements occurring each day through the intelligent and committed efforts of Massachusetts hospitals and caregivers. Those improvements are helping to bend the cost curve in our state downwards.